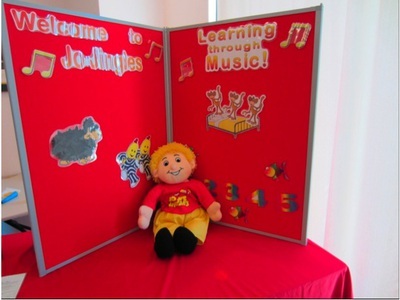 I have been going to Jo Jingles for a few terms now with my little son, and enjoy the fun sessions particulalry his interaction with music and movement. Every week the presenter, in our case the fabulous Tara, introduces an educational theme from a whole host of topics. This might include food, colours, shapes, animals, numbers and recently we had the Olympics as our theme. The session will work around this theme through the medium of music, movement and lots of singing. The session commences with all the parents and children sat in a circle and you sing the Jo Jingles welcome song. I didn't know the song prior to joining up but don't let this put you off; after a few weeks you'll be singing it in your sleep. Jo Jingles, the soft toy character then comes round to say hello to each child. The first time we attended, my son decided to have a stand off with Mr Jingles and no cuddles or greetings were forthcoming. Now three terms later, poor Jo gets dragged around the class and is fought over by the now, not so shy attendees. Class size is limited to 15 children, and this for me, this ensures an intimate session without overwhelming numbers. The class is fun, upbeat and one where participation is a must, and that's for both the parent and the child. I don't think your child would get as much out of the class without an active advocate of a parent. So come prepared to sing, shake and boogie to the tunes. The class is 45 minutes long and your child will always get to play with two musical instruments. We've so far enjoyed a range of musical shakers, tambourines, drums, rattles, bells, triangles, and some other wooden percussion instruments. 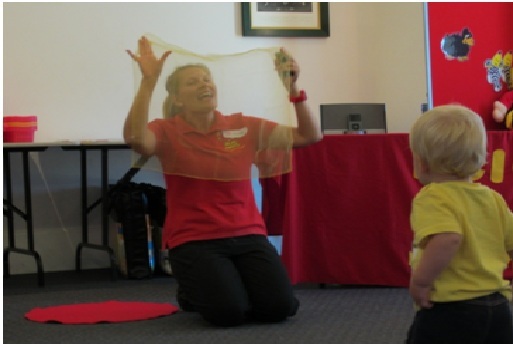 In addition to this, there are lots of props used in the sessions such as peekaboo scarves, ribbons, rainbow pom poms, soft toys and lots of bubbles which have the toddlers very engaged and excited. I have the pleasure of having Tara as our class presenter, who never fails to impress me with her energy, positive attitude and the way in which she interacts with all the children. Plus the fact that Tara is completely un-phased by lots of the toddlers not doing exactly what they were meant to do, but instead she understands that at this age, learning is a little self paced. Having previously participated in Gymbaroo, I cannot help but compare the two classes. Gymbaroo to me, comes very overpriced, and for my part (each to their own), you are paying a lot of money to spend half of the lesson letting your child run around their fantastic gym equipment. At $17 a session, I found this a bit steep. 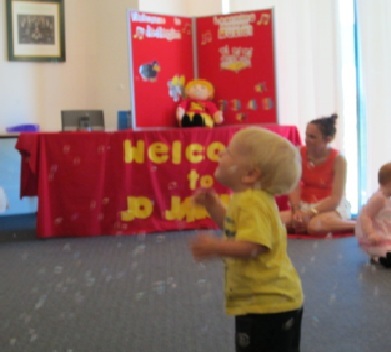 Jo Jingles, on the other hand, works out at $10 for babies or $13 for toddlers onwards. This is far more reasonable, especially for such a structured class where the presenter is on hand and leading activities for the children for the whole time. It comes down to personal choice, and obviously what your child enjoys, but we've had a lot of fun sharing our mornings with Mr Jingles. To find your nearest class, click here. There is an expanding range of classes to be found at Jo Jingles, with four different age range groups on offer. Classes start from 3 months until 5 years of age.